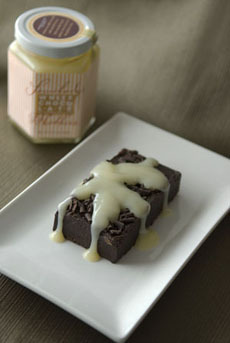 A brownie with Somebody’s Mother’s heavenly white chocolate sauce. Photo by Corey Lugg | THE NIBBLE. This is the second part of our “The Best Of 2009”: the Top Pick Of The Week specialty and gourmet food products that have become a permanent part of our lives. This week, our picks are the sweet stuff. Since we’ve chosen “everyday foods,” our list doesn’t include the fabulous boxes of gourmet chocolate that are special-occasion buys. But don’t worry: All of our picks are indulgences.